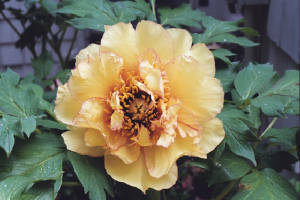 Intersectional hybrids are produced by crossing herbaceous and tree peonies. 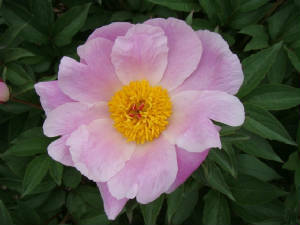 The cross is inter-sectional because herbaceous peonies and tree peonies are in different sections of the Genus Paeonia. The intersectional cross can be made in either direction but, is much more difficult in the reverse direction. Generally, intersectional crosses are extremely difficult in either direction. In peonies, the normal (forward) direction is with the herbaceous peony as the seed parent and the tree peony as the pollen. 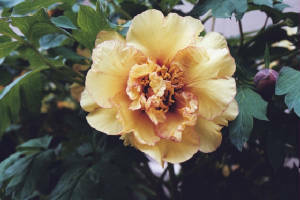 This is written as (Herbaceous x Tree Peony). Shown below are a few of the better parents for producing intersectional hybrids. 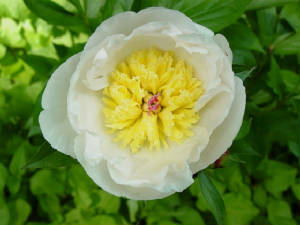 For a more complete list of pollen and seed parents proven to be effective in the intersectional cross see Paeonia, (Vol. 25, No. 2 and Vol. 31, No. 3).